The coconut is the fruit of the palm tree cocos nucifera and is widely distributed throughout the tropics. One of the most useful trees in existence, called the “tree of life”, every part of it has some value. The tree itself provides timber and roofing for its communities, while the fruit provides food and drink, material for weaving and even drinking vessels. The fruit is a staple part of the diet for many of the world's population nearly one third in fact, and provides a range of nutritious foods, from coconut meat, to coconut water, milk and oil. Promotes healthy bones and teeth by improving our ability to absorb calcium and magnesium. Reduces the risk of heart disease by improving cholesterol ratio levels. Improves thyroid function and helps to increase metabolism, energy and endurance. Helps reduce symptoms associated with diabetes by improving insulin use within the body. Aids digestion and helps the body absorb fat-soluble vitamins. Excellent for the immune system. Possesses antiviral, antifungal, antibacterial, and anti-parasitic properties to help the body fight bacteria and viruses. The fruit’s name comes from the Spanish coco, meaning ‘goblin-like’ or ‘monkey-face’ because of the appearance of the three ‘eyes’ on the shell. Inside the shell is a thick brown coating covering the coconut kernel, or ‘meat’. Inside the kernel is the juice that is only palatable when taken from young coconuts. But this juice is not to be confused with coconut milk. Coconut water is the clear juice found inside a coconut when it's cracked open and can be consumed fresh or used in recipes. Coconut milk is made by boiling the meat and water together. It is made from one part shredded coconut to one part water, simmered and then strained through cheesecloth, with the excess pulp squeezed out. 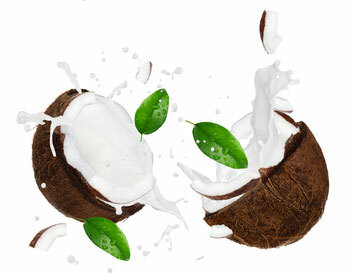 Coconut cream consists of four parts shredded coconut and one part water. It is much thicker and creamier than the milk. Coconut milk is a wonderful alternative for anyone with an allergy to cow’s milk or simply wishing to go vegan with many positive health benefits. It gives smoothies a wonderful creamy texture and a unique taste. As it has a pleasant taste without being too sweet, it is the ideal choice when looking for a base for fruit smoothies. 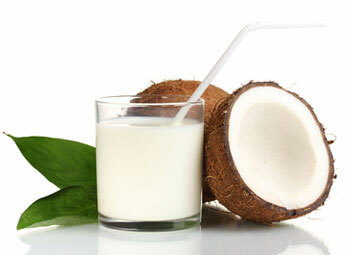 Fiber – Coconut milk contains much more fiber than most other drinks. This is because it is made from the meat of the coconut. Each cup of coconut milk contains over 5 grams of fiber. Fats – Although coconuts are high in saturated fats, these are not animal fats and the fat is easily metabolized by the body. The main fat, lauric acid, is found in mother’s milk. This has been shown to promote brain development and bone health and can lessen your chances of developing heart disease. It also contains small amounts of B vitamins, Vitamin K and some Vitamin C and Vitamin E.
Coconut water is the fluid found inside the coconut. The best coconut water comes from immature or green coconuts. It contains virtually no fat and very few calories. In fact there are only 50 calories per cup and most of these come from natural sugars. In addition it contains minerals such as potassium and magnesium. Did you know that coconut water has more potassium than a banana? Other key minerals include calcium, iron, magnesium, phosphorus and zinc. Its potassium and sodium content make it a smart choice when you become dehydrated, whether from physical activity or sickness. Many people drink coconut water after vigorous exercise to replace lost electrolytes. Its vitamin content makes it a nutritious sports drink and a viable alternative to manufactured sports drinks. 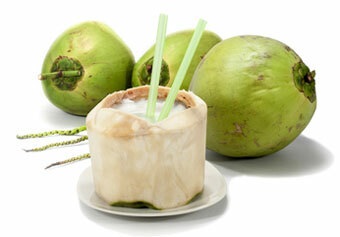 Of course the best source of coconut water comes from fresh, young coconuts. But don’t worry if you can’t find them. Fresh coconuts are not always readily available. Fortunately, it is now possible to buy coconut water ready-packaged, but as with coconut milk, read the labels and choose a reliable brand. Many commercial brands of coconut water can be high in sugar, so choose drinks with less than 5 g of sugar per 100 ml.